The Cavaliers owner is being mocked online for using Comic Sans font in a letter to fans about LeBron James' departure. Editor's note: NBA.com and CNN.com share the same parent company, Turner Broadcasting Services Inc.
(CNN) -- Dear computer users: If you're ever going to write a fuming letter, think twice before setting the font to the oh-so-mockable Comic Sans. Take it from Dan Gilbert, the owner of the Cleveland Cavaliers, the NBA team that lost its star basketball player, LeBron James, on Thursday night. Unless you're a fourth-grader, or being ironic, or the author of a comic book, or on vacation from the 1990s, never use that typeface. On Twitter, discussion of Gilbert's font choice briefly trumped the debate about James' move to the Miami Heat, according to the blog TechCrunch, which posted a screen grab of the trending topics from that messaging site. One of the blog's writers, MG Siegler, says the font faux pas is especially egregious given how much press Gilbert's letter is receiving. "Normally a staple among six-year olds and grandmothers, Gilbert for some reason decided to use the font to write what will undoubtedly be the most public message he will ever write," he writes. "And it's too bad, because the content of the message itself is quite good -- very juicy. Gilbert's use of quotes, capitalization, and bolded letters makes it very clear just how pissed off he is." Siegler calls Comic Sans "probably the worst font ever to grace the computer screen." Comic Sans is the brainchild of Vincent Connare, who created the font while working as a "typographic engineer" at Microsoft in the 1990s. There were primarily two ideas behind the font's origin: Microsoft wanted a font that was more "FUN" than the rest, and comic-book lettering hadn't transferred well from books to the computer screen. "There was a consistent style used in comics, which was quite unlike the style of lettering you see in newspaper cartoon strips," Connare writes on Microsoft's website dedicated to the font. "I also noticed that many people were inappropriately using drafting lettering in comic speech balloons." Since the '90s though, Comic Sans has become a mockery on the internet. A movement called "Ban Comic Sans" has been trying to kill the font. "The typeface has been used in countless contexts from restaurant signage to college exams to medical information," an introductory post on the site bancomicsans.com says. "These widespread abuses of printed type threaten to erode the very foundations upon which centuries of typographic history are built." In a CollegeHumor.com video about a fictional "font conference," a guy representing Comic Sans swoops into the final scene, dressed as a boyish superhero in a cape and tights, only to find that all of his friends have already been killed. "Y'all good? I'm gonna peace out. If anyone needs me, Comic Sans will be over here!" the character says before stepping out of the frame. Connare is apparently able to maintain a sense of humor about his creation. "If you love it, you don't know much about typography," he told The Wall Street Journal in 2009, before adding: "If you hate it, you really don't know much about typography, either, and you should get another hobby." 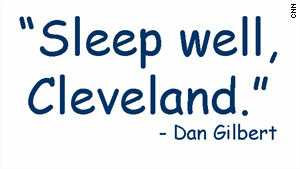 As for Gilbert, the Cavs' owner, the font choice may have served the purpose -- whether intended or not -- of getting his message out to the public. Stories about the fuming letter on the websites for The Washington Post, ESPN, CBS Sports and Time all mentioned Gilbert's choice of Comic Sans. "You see, he wrote in Comic Sans so that you would know he's serious," Matt Moore writes on a blog at CBSSports.com. On a Washington Post blog, Michael Lee writes that Comic Sans only adds to the "ridiculous nature of the evening" on Thursday. TechCrunch's Siegler, referring to the fonts made up mostly of symbols, said he will "await a LeBron response in Wingdings."